"The Fitness America Pageant began in 1989," Lou Zwick told the 100 competitors gathered at the Marriott Manhattan Beach hotel for the orientation meeting. An executive at ESPN came up with the idea, Zwick explained, and within a few months the American Sports Network was at Knotts Berry Farm taping their first fitness show. 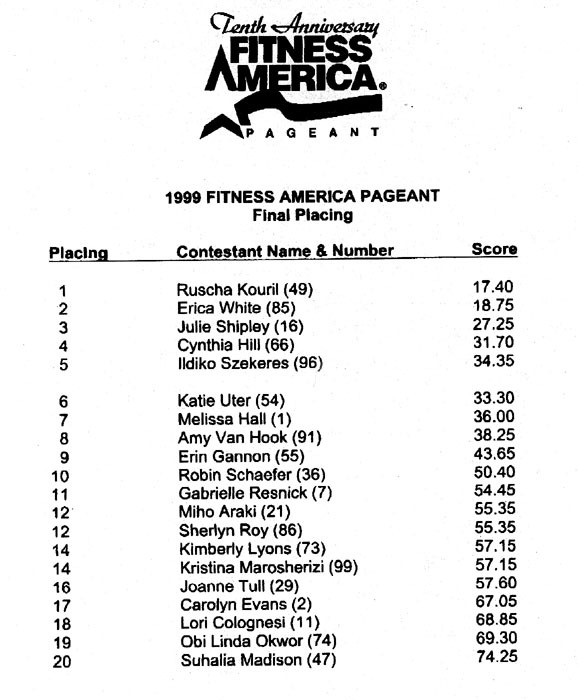 This year's Fitness America was held at the Performing Arts Center in Redondo Beach, and the winner was 7-time German gymnatics champion Ruscha Kouril. Zwick admits the well-organized event we witnessed on stage was a far cry from the early versions of the competition. "It's taken us a few years," he says, "but instead of a small audience and even fewer competitors we now stage a very complex competition, with an international lineup of contestants that is televised by sports networks all over the world. " Fitness America is expanding internationally as well. This year there were four international versions of the competition, and next year there will be 10 - giving winners of regional and national contests a world-wide stage to move on to.